Strengthening opportunities for individuals with Down syndrome and those who support them to learn, earn and belong. We are more alike than different. Teams are a great way to show your spirit at the Designer Genes Walk for Down Syndrome. Many of our families and community members put a theme together to show their group’s support for an individuals with Down syndrome. 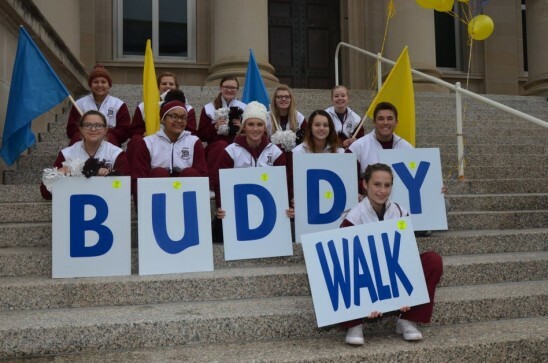 Examples of some of our teams at past walks include: Ryker’s Rockers, Lochlan’s Peeps, Cristian’s Crusaders, Raisin’ Awareness, The Purple Queens, Gracie’s Groupies and many more. Teams create groups with everything from ribbons to t-shirts, costumes to balloons. Simply use your imagination and remember to inform those coming to walk with you how your team will be dressing, meeting, etc. These are important details to make sure your group gets together. For a Team Captain Packet that contains information on Walk Stars Posters, VIP Tents, and more, email us @ info@designergenesnd.com. Each year we provide teams an opportunities for a team photo at a designated spot on the Capitol Grounds. The team photo spot will be announced at the walk site. Team photos will be posted to our Facebook Group page after the walk. Your contribution will be greatly appreciated and go to support activities in North Dakota. We're proud affiliates of NDSS, NDSC, Global Down Syndrome Foundation and DSAIA. Learn more about these organizations. Designer Genes of North Dakota © 2019. All Rights Reserved.